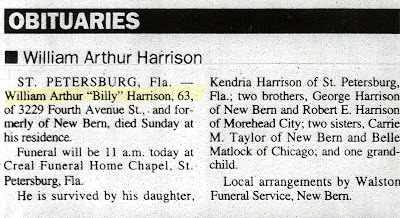 son, William Arthur Harrison Jr.
William Arthur Harrison Sr. was one of my grandfather's brothers and unfortunately, I did not have the opportunity to meet him before he passed away. Something wonderful that came out of my research journey has been that I've been able to connect with one of his descendants and his wife and kids. 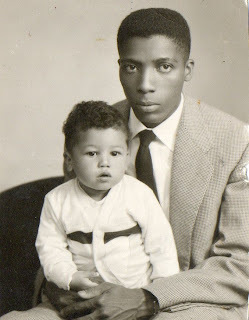 How we connected I wrote about in this series of blog posts: A Comment Goes Unnoticed --Part one, A Comment Goes Unnoticed --Part two, and Thankful Thursday: A Comment Goes Unnoticed...No Longer! 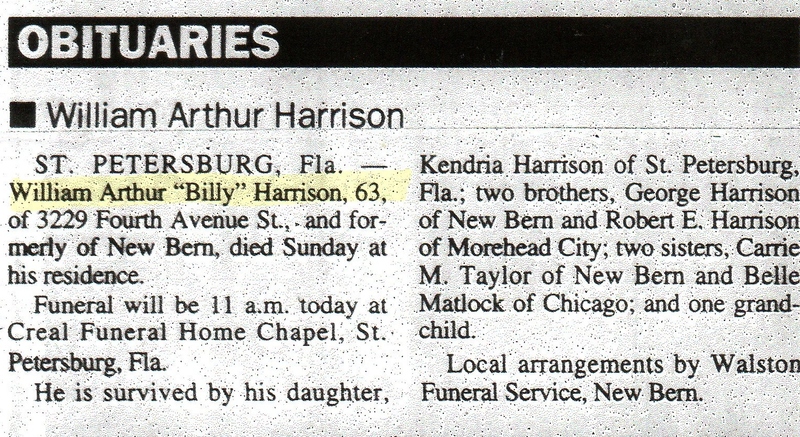 There is another cousin that is out there that was made evident by this obituary --Kendria Harrison. Now this blog has been a wonderful way to connect with cousins. Maybe with a little luck Kendria will decide to Google her name, or perhaps her maiden name because she may be married now. Or perhaps one day she will be searching for some information on her father and she will stumble across this blog post. It certainly would be great to track down another cousin. That's great to hear that your blog has helped you connect with cousins! As a fellow genealogy blogger, that is very encouraging to hear. Thanks! I hope she finds it too. Your uncle looks so young holding his son there. Lots of luck with the cousins. Hi Kristin, yes he does look very young in this picture. Thanks for the luck. Here's hoping. You never know.